Note: One of three versions of Billie's life story published within 3 months of each other — followed rapidly by the unauthorised Billie Piper: The Biography and Billie's own autobiography Growing Pains. 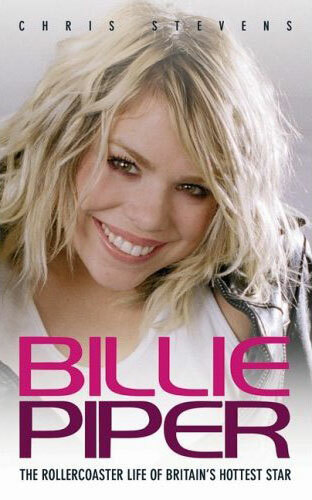 Summer 1998: Billie, aged fifteen, explodes on to the celebrity scene as the youngest artist ever to debut at number one. A record-breaker — and a rule-breaker — from the start, her chart triumph marked the beginning of a rollercoaster journey that continues to this day. From her failed marriage to Chris Evans to her hugely successful switch to acting, Billie has experienced a hell of a lot in her blistering career — and now the highs and lows of her remarkable life are laid bare in this, the first biography of the Doctor Who darling. Following Billie as she grows up in the harsh glare of stardom — achieving exceptional acclaim in her chosen fields, but suffering, too, from health scares, vicious tabloid rumours, and even death threats — Chris Stevens takes us on an emotional expedition, revealing Billie's innermost thoughts and her responses to her extraordinary experiences. Whether describing her marriage to a millionaire sixteen years her senior, her travels around the world as a teen idol, or battles with aliens in the revamped Doctor Who series, Billie Piper gets up close and personal with this pop-princess-turned-sci-fi-sweetheart, who grew from her child-star roots to emerge successful, sassy and superbly down-to-earth.